Five primary schools in the Autonomous Region of Bougainville welcomed the new academic year with the official opening of school library buildings. The Australian Government continues to support these primary schools with new infrastructure through a public-private partnership with the Autonomous Bougainville Government, the Government of Papua New Guinea and Digicel Foundation. Kepesia, Mungkala, Sipuru, Kekesu and Kavaronu Primary Schools opened their new library buildings from 5-9 February 2018. This infrastructure complements previous infrastructure received in May 2017. 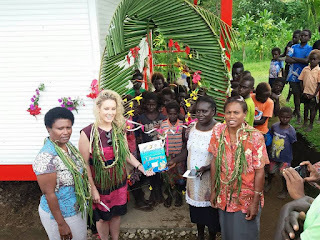 Nicole Smith, Second Secretary from the Australian High Commission, said one of Australia’s education priorities is to assist the Government of Papua New Guinea to improve literacy and numeracy outcomes of early learners throughout the country. Literacy and numeracy are essential skills for all children to develop. Without them modern life becomes almost impossible. “A library is an important resource to have whether it be in a school or in the community as it supports children’s literacy and their learning. Research shows that a library that has a wide selection of books and other materials can both support literacy skills and help foster children’s love of reading,” Ms Smith said.